I am a very frustrated gardener right now. Our last frost date was only last week so you know my plants aren't quite producing yet. I have nothing to harvest or even really tend to, except weeds. Why is it that a late frost can kill a vegetable plant, but not weeds? Weird, right? Anyway, the one thing I do have a lot of is naturally growing medicinal plants like dandelions, plantain and lambs quarters. So I'm picking and drying plantain herb today. 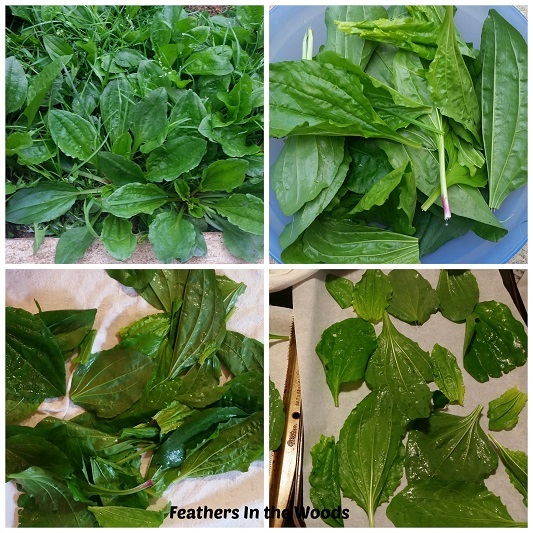 The herb Broadleaf Plantain (Plantago major) has many amazing uses especially for cuts and bug bites. It really takes the 'owe' out of cat scratches too! Plantain is a perennial 'weed' you probably have growing in your yard or garden. Not to be confused with the banana type fruit you see in some stores. There are about 250 different species of plantain but we're looking at 'Plantago major'. That's it's official name although it's nickname is "Englishman's foot" by Native Americans because it seemed to appear everywhere in European settlers colonies. As much of an annoyance as it is, it has many great uses also. It's said that plantain was once called 'snakeweed' because it helps with snakebites, but don't go trying that just cause I said so! (see a Dr of course!) It is believed to be brought to the Americas by Puritan settlers for medicinal uses. Plantain leaves can be crushed up and applied to cuts and scrapes to help stop bleeding and pain. They also help with insect stings or bites. They are edible and the younger leaves are great in salads while the older leaves are tougher and are better cooked into soups and stews. The seeds can be ground into a flour substitute. The roots can also be used for pain. Today though I'm focusing on the leaves and their uses as a tea. A strong tea can be made of dried plantain leaves and cooled then applied to sunburn or brush burns to speed healing. It can be added to a bath to cool a sunburn. It's also good for rashes and poison ivy. Some people have found it helps with eczema also as it is very soothing to the skin. I prefer to drink plantain tea as it has many internal uses. It can soothe a sore throat and cough. It helps with digestion, ulcers, heartburn, IBS, mouth sores, and is great to drink when you have diarrhea since it will replenish vitamins and minerals lost through sickness. It is also drank as a tea to help with kidney and bladder problems. When gathering plantain herb to dry, make sure the plantain you gather has not been sprayed with weed killers, insecticides or any other chemicals. I only gathered leaves this time and since I was drying the plantain leaves, I didn't worry about size. Don't worry about breaking off the stems, they can be left on. It's better to gather plantain leaves after it begins to flower, but I wasn't into waiting so I went ahead and picked this early stuff. I'll just pick more in a few weeks, it's literally growing everywhere! I washed the leaves by putting them in a bowl of warm water and adding about a tablespoon of baking soda then swishing them around by hand. I let them sit a few minutes while I got the oven set to convect at 170 then rinsed them off. I shook them to get the water off then placed them all in a lint free towel. Then I wrapped up the corners and sort of swung it around to get the rest of the water out. Then I placed them on baking sheets lined with parchment paper trying to keep them from touching, and put them in the oven. I used the method I wrote about here in How To Oven Dry Fresh Herbs. You can also use a dehydrator on a medium setting. It should only take a few hours with this method. Once the plantain leaves are dry I put them in a jar. I crushed some of the dried plantain leaves, but I left most of them whole. I really prefer to crush them right before I use them, but there's not always room in the jar. I'll leave the lid off for the next few days. In case there's any moisture left in them it will have time to evaporate off. Any time I want to make a tea I just crush up about a tablespoons worth and steep as normally for tea. Strain then drink. It's definitely a natural tea taste, but I just add a little local honey and it is so good! I hope you like it too. I keep hearing the plantains have health benefits, but I haven't tried them myself (we feed them to the chickens and bunny!). I am thinking that I might try to add dry plantains to my homemade cocoa butter salve now, so thanks for the post! Great post! Its too dry where I live to grow as a weed, but if I see it around I always pick a few leaves! Oh wow, how frustrating! I don't understand their strategy at all but I'm glad you found this post! Love your article. I'm new to medicinal herbs/teas. Thanks, I'm glad that you like it! Feel free to message or comment with any questions you have....and let me know if you didn't get the medicinal teas download. Will def try the dry leaves now. I bruise fresh leaves a little before adding them to my pot of tea. My fave is with chamomile, slice of ginger, lemon & honey if I have it. 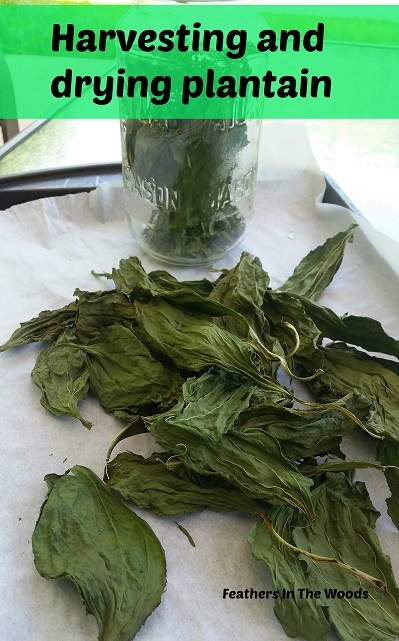 I also infuse the leaves to make oil, & with vodka for tinctures. Truly a miracle plant! Yes, it really is a miracle plant! I use plantain oil for so many things. It's great especially in skin salves. I use it for burns and they heal wonderfully. I'll have to try the plantain tincture idea. Thanks! I bought wild plantain and it has the whole thing in the bag. The leaves, flowers, seeds and I'm sure roots. Can I use all of that for tea? It's all mixed in. I wasn't expecting that when I purchased it. I would pull out the leaves and use just those if at all possible...unless it's all dried and chopped together which I would not have expected either! You can use it all for tea though it's going to have a different flavor than if you used just leaves a lone. HTH!